I’m in Chicago as a guest lecturer at the School of the Art Institute of Chicago, and loving it. As many of you know, Chicago is an architectural feast, and being able to combine business and architectural sight seeing in such a city is a treat. I am of course biased, as a great number of Chicago’s landmark buildings and urban plans were designed by Daniel Burnham, but namesakes aside, it has been an honour to be part of this city even for a brief period of time. 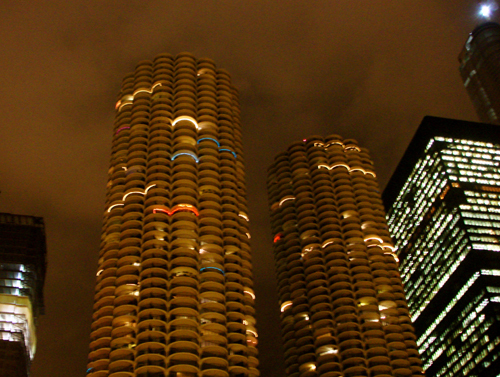 One of the buildings that has really stood out for me is the iconic Marina City, designed by Bertrand Goldberg. Film buffs may remember the building as the site of the classic scene in the Steven McQueen film The Hunter, in which a car chase comes to an unexpected end as the car careens off the 10th floor of the underlying parking garage. 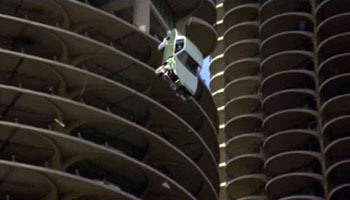 This feet was repeated for an Allstate insurance add several years ago, so if anyone has a desire to launch a car out of a building in the downtown of a major city, this is your place. The reason it stands out for me however, is the framework it provides for the residents to have a hand in the external design of the building. An unintentional aspect of the architecture perhaps, but as the top image shows, it is wonderful to be able to view the building from a distance and be able to read the colours, the collaborative spirit as lines of lights stretch across several units, and the chosen colours of those living inside. And it’s not even Christmas. As always, I find these moments to be examples of the potential which exists for people to have a more direct role in the external visuals of their buildings. I’ll miss this city, and my lofty view of the Tribune building and plaza, but my talk in Riga awaits, and I am in hopes of more architectural treats there.